The other week, the Marmoset – who is prone to a little bit of political rough and tumble on social media – was rightly chastised for labelling someone he was debating with as ‘lazy’. But in the spirit of ‘hate the sin, love the sinner’ I retract all such personal or smug admonitions…. …however I stand by my contention that the current political debate in the UK, especially on the left, and with particular regard to a certain J Corbyn esquire, is being stifled and infantilised by simplistic, reductive generalisations, which are, at worst, wilfully disingenuous, and at best a manifestation of a knee-jerk lack of intellectual rigour. So, pop pickers, here are my ten most Marmoset-mangling mindnumbers, presented in all their glory – and hopefully subjected to a little illuminating scrutiny. If you’re too young to know who this guy is… then you’re too young!! You can see that El Corbo secured 49.6% of the vote from fully paid up Labour Party members. That’s less than half – but if we call it half for the sake of argument, it’s still not an ‘overwhelming mandate from party members’. His actual majority came from 84% of registered supporters and 58% of affiliated supoorters. By the rules of the contest this was indeed an entirely legitimate and overwhelming victory – but NOT an overwhelming mandate from the membership. Personally I think the idea of selling votes for three pounds a pop – the three pound poms – was insane. Why should someone who lays out less than the price of a pint have an equal say in the election of party leader than someone like myself who has been a full party member on and off for 38 years. This isn’t Corbyn’s fault… It was a well meaning but entirely misguided attempt at increased democratisation by a previous Labour leadership. Let’s dig a little deeper – and yes, that actually means getting out of your rocking chair, and thinking about what the statistics actually mean. In saying ‘he has an overwhelming mandate’ on the basis of last September’s numbers it begs a much bigger question as to who the Labour Party actually is. Are we the actual membership, the people who go to meetings, knock on doors, become councillors, work politically to actually do stuff etc (roughly 60% as of last September)? Are we people who pay a few quid for a vote (25%)? Are we supporters attached to affiliated Trade Unions or other organisations (15%)? Standing up for Real Labour? Of course, things have changed since September and the numbers have shifted. There are now 515,000 fully paid up members – although only 350,000 will be able to vote in the upcoming leadership election; 129,000 registered supporters (twenty-five pound poms! ); and 160,000 affiliated supporters, but, regardless, the proportion of supporters to actual members is significant. Whichever way that pushes the outcome, it makes me uncomfortable. How on earth did a grown up political party in the modern age – having accepted the general principle of ‘one member one vote’ – end up with three different electorates – with three different qualifying criteria – and three different timelines and date cut-offs for voting eligibility? That alone could cause a non-tribal voter to wonder whether we deserve any kind of power at all. Spit out your chewing tobacco, old timer, we can go deeper again. Assuming that Corbyn achieves an equal or even greater majority this autumn – what will that mandate mean? The superficial reading of the ‘overwhelming mandate’ is that it’s a vote for everything-that-Jeremy-says-so-just-get-in-line-and-do-that, losers! The Leader shall […] ensure the maintenance and development of an effective political Labour Party in parliament and in the country. ‘In Parliament’ – that’s the mandate according to the Party’s own rules. If a leader fails in that primary duty, then they have failed in that mandate, and therefore leadership challenges, votes of no confidence etc are entirely legitimate. It’s not just about saying ‘the Parliamentary Labour Party must respect the mandate from the membership’ (and or supporters etc) – it’s also a nod to anyone voting for a new leader, that they have a duty to understand the broader and deeper significance of that mandate. It requires a little work, a little thought. It’s about the member/supporter/affiliate casting their vote – and granting that mandate – remembering their own responsibility to the aims of the party as it was founded. But perhaps we shouldn’t be surprised if many of Corbyn’s supporters have something of a woolly notion of what democracy is all about. The day before the local, Scottish and mayoral elections in May, Jeremy Corbyn wrote to party members. He said: ‘Elections are about taking sides.’ The trouble is, they aren’t – no, really, they aren’t – and reducing democracy to such a bald binary is simplistic… and lazy. If you believe the words of Momentum founder, Jon Lansman earlier this year, then you don’t support Clause 1 of the Labour Party rule book. That’s Clause 1, folks… don’t be lazy, look it up. Oh… ok, I’ll do it for you, as I’m nice. Its purpose is to organise and maintain in Parliament and in the country a political Labour Party […] and promote the election of Labour Party representatives at all levels of the democratic process. Getting elected is right up there, right at the core of Labour’s raison d’être, and it’s for precisely the opposite reason than Mr Lansman posits. For centuries, working people had no power whatsoever. Then as working people began to organise, they could effect some change through protest and withdrawal of labour and the lobbying of those in power. But the Party itself was formed so that the interests of Labour could take the reins of power themselves. The Labour Party isn’t about knocking on the door, or waving placards outside the window – it’s about being in the room and actually running things. If we want to save the NHS, adult social care, state education, etc etc etc then we have to win, we have to be in power. My wife who works in local authority social services needs a Labour Government in power to make sure she can go on doing her job. My friend who has a son with Downs Syndrome needs a Labour Government in power to ensure that there are support structures in place for his future. Lansman’s tweet underlines how out of touch Momentum is with the objectives of the Labour Party and the real lives of ordinary people. And if you still aren’t convinced that winning isn’t some marginal perk for people with no principles, take a look at the Conservatives. They got themselves sorted in a week. The losers withdrew from the race, because they understood that the only thing that mattered was being in control, which they are, and from which position they are going to shape our society for a generation. That’s democracy, Mr Lansman; that’s the primary purpose of the Labour Party. Ok, let’s start by saying, that, yes, of course, much of the media has a right of centre ideological bias and vested interests – but characterising the wide variety of outlets as one homogenous right wing lump, and blaming it for Jeremy Corbyn’s failure to engage the public outside of his activist base isn’t just intellectual bat-guano, it’s paranoid M&S indolently fact-ignoring bat-guano – which is particularly exposed when the media-blamer starts on a nostril-flaring anti BBC rant. A few months back, the marmoset ruminated on the noisy and misogynist hate campaign mounted against the Beeb’s political editor Laura Kuenssberg, and more recently acquaintances have bemoaned the corporation’s role in the Brexit vote. Charges range from ‘misguided objectivity’, to ‘a failure to expose Leave campaign lies’, to outright accusations of collusion with a ‘neoliberal elite’ in exchange for fat-cat salaries and charter renewal… before the accusers pop off to read the latest edition of The Canary. Having spent most of my professional life working in various roles for the Beeb, I can say with some authority that if the BBC has a bias problem at all, it’s in tempering the liberal left leaning political correctness of many of its employees – me included!! Facts aside, media blaming is not only artery-cloggingly lazy, it’s deeply patronising. Or alternatively Noam, the ‘general population’ is made up of people just as individual as you who are perfectly well aware of ‘what is happening’ because it’s about the life as they live it and they don’t need you patronising them. I’ve spent the best part of thirty years working in different media, and if there’s one thing I know, it’s that people are smart. They’re media savvy and two steps ahead of pretty much anything you throw at them. As a species, we interpret the world through our environment, and what actually happens to us. We’re naturally impervious and resistant to being told what to think. Margaret Thatcher didn’t put swirling spirals on our TVs and brainwash the nation into becoming economically self interested. She sold everyone their council houses. Policy not propaganda. The NHS has near universal support not because there is a deep ideological understanding of the ideological virtues of collectivised social care, but because the reality of having to pay out when you get ill is bloody terrifying. Of course propaganda has a considerable and ignominiously successful history, but that same history also tells us that propaganda in its purest form requires all counter narratives to be ruthlessly suppressed as well. Much as John Humphreys interrupting interviewees on The Today Programme is annoying, it’s hardly the Stalinist airbrush at work. When I hear the confused cry of the BBC-Blamer, what I’m actually hearing is a charge that the BBC weren’t propagandist enough. It’s not enough for Auntie to present a range of arguments – as they were at pains to do throughout the EU referendum – THEY NEED TO TELL PEOPLE WHICH ARGUMENTS ARE WRONG!! BECAUSE PEOPLE ARE TOO STUPID TO WORK THAT OUT FOR THEMSELVES. And as for the right wing media conspiracy against He That Is Corbyn, it’s not enough that we have wall-to-wall John McDonnell, Diane Abbott, Paul Mason, Emily Thornberry, Len McLuskey, Owen Jones, Richard Bourgon, Rachel Shabi and assorted Momentum wonks we’ve never heard of – apparently the BBC NEEDS TO TELL PEOPLE THAT OUR GUYS ARE RIGHT ABOUT EVERYTHING AND STOP ASKING THEM DIFFICULT QUESTIONS! Media-blaming is predicated on conspiracy paranoia coupled with an archaic and belittling assumption that there’s a lumpen proletariat waiting to be woken from its ignorant slumber. And as with all conspiracy thinking, it’s impossible to disprove – the perfect mindset for the lazy thinker; the Goblin Teasmade of political analysis. (NB the reader should be aware that I have been accused on the 38Degrees Facebook page of being in receipt of ‘brown envelopes’ full of cash, courtesy of the BBC, in return for my eloquent posts on social media defending BBC journalistic objectivity. This one extends beyond MPs to anyone – such as myself – who might express anything other than rapturous adoration for His Jeremyness. As someone who first joined the Labour Party back in 1978 – yes that’s 38 years ago folks! – and left it for several years precisely because of Tony Blair’s foreign policy – I’m not going to waste time on the well rehearsed factual exposition as to why neither I nor any of those MPs can be accurately described as Tory – pink, red, ‘lite’ or otherwise. Some may have been allies of the former Prime Minister – but frankly I’m not sure that ‘Blairite’ really means anything any more. I mean, he’s been out of the picture for 8 years, and it’s not as if he’s waiting in the wings for his glorious return to power. And as for being careerist… yeah, I’m sure that all those who cast their vote of no confidence against were expecting immediate preferment to… to… what exactly? Oh hang on a minute, they all know that they risk deselection and unemployment. No career benefit whatsoever. Presumably they feel that the chances of deselection are marginally less than the political oblivion they fear from a continued Corbyn leadership. Hardly self serving. So, let’s get off our arses and fix that door that’s been squeaking for the last year and talk about why this oft repeated mantra is so synapse-paralysingly lazy. It’s not the same as racism – that’s not what I’m saying – but the thought process that underlies it follows the same principles. Lazy – just like racism. This also manifests as: ‘All Tories are public schoolboys, driven by greed, selfish c*nts’ and other increasingly bile-infused epithets. All Tories look like this. All of them. Every single one. More recently the same style of unthinking generalisation has been applied to Brexit voters who are regularly described as ‘knuckle dragging little Englanders‘ or the less nuanced ‘ignorant racist twats‘. Oh God, I feel tired. Whether or not a proportion of Tories are some, or indeed, all of these isn’t the issue. Ditto Brexit voters. On the plus side, at least here we are talking about people who actually are Tories or voted for the Conservatives – so far, so accurate – ring the bells!! – but that’s as good as it gets. Over eleven million people voted for the Conservatives in 2015. Seventeen million voted for Brexit. If we’re going to write them all off as political pond life then not only do we wave goodbye to any hope of electoral success in the future, but, as with the flip side of this chart topper (Number Five above) we stop thinking; we stop listening; we close down the argument. We label the opposition as ‘non-people’ and a proto-racist mindset rears its head again. If we, on the left, want to win an election in the future, we can’t do that without persuading non tribal voters – i.e. those who have voted Conservative but aren’t committed Conservative party supporters – and we are absolutely not going to achieve that by telling them that they are all selfish, ignorant cunts. We have to listen and accept that people have good reasons for preferring a Tory manifesto to a Labour one. And yes – there are plenty of good reasons. I know many kind and generous people who do fantastic work for the community, who voted Conservative in 2015 because, for example, they were self employed or run small businesses and simply felt that their livelihoods were at risk under a Labour administration. Others simply didn’t trust Labour with the economy – not because they ‘fell’ for Tory propaganda, but because Labour didn’t make a good enough case. There were many who really wanted that EU referendum – which only the Tories were offering – and as we have learned, if we’ve been paying attention, wanting out of the EU is most definitely not ‘all about racism’. The EU – or rather our administration of the EU – has failed millions of people – especially on the margins of our society. If the EU means, in reality – I mean in practical every day reality – that hundreds of thousands of people are priced out of jobs in their own communities – then it’s the EU’s fault for not addressing that, and frankly we shouldn’t have been so surprised when those voters chose the Leave option. It’s not knuckle dragging, it’s not racist, it’s not ignorant – it’s startlingly rational, and it’s our fault for not listening, for not seeing that truck thundering down the road to knock us flat. Of course some people consider themselves more nuanced. They eschew direct abuse and come out with things like: ‘Voting Tory is immoral’. Ugh. In some ways this is worse. It’s patronising. It’s arrogant. It assumes a moral righteousness that suggests that a vote for the conservatives is offending a higher power, offending an absolute sense of right and wrong. It says we have the universal forces of righteousness on our side. Frankly you might as well throw God into the argument – indeed some MEMEs like to claim Jesus for the cause as I’m sure anyone reading this will have seen. Well, sure, some Conservative policies are arguably immoral, but the voter isn’t immoral for choosing that option. It’s a democracy folks, and it’s about winning arguments, persuasion, context, and the nuts and bolts of choosing who the voter thinks will do the best job of actually running the place. 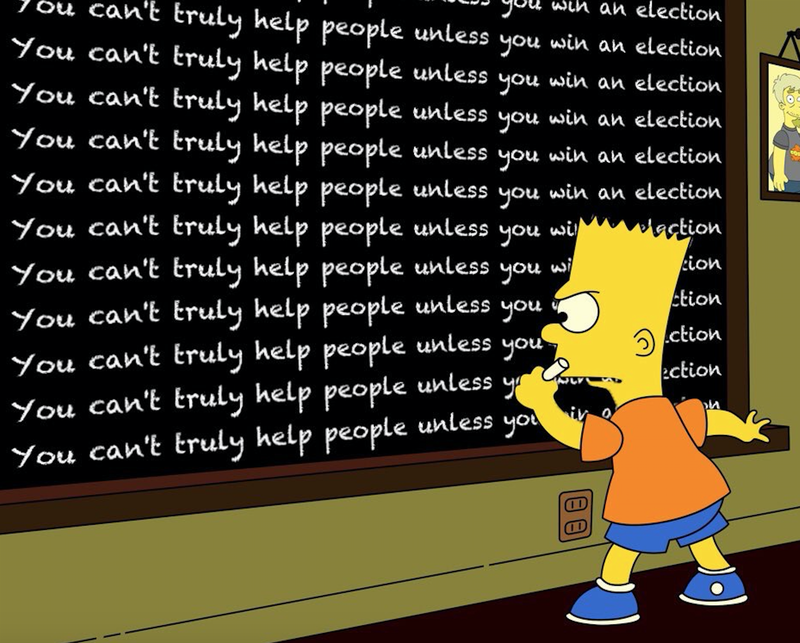 If our side loses it’s not because the other voters were stupid or immoral – people don’t vote for abstract reasons – it’s because we didn’t win the argument, we didn’t make that fundamental connection with the electorate’s day-to-day concerns. And if we want to win next time, we’re not going to do that by suggesting that the millions of voters we need to change their minds should do so to avoid a further moral transgression. On a final note about the self defeating nature of lazy, knee jerk name calling – take a look over the fence. Conservative politicians may well express a fair degree of scorn for Labour or socialist policies, but you will rarely, if ever, hear them deriding the electorate for their choices. Why not? Because they want their votes. No he doesn’t. Nor does The Canary. Nor does any blog or website or documentary with ‘Truth’ in the title, even if it’s by Paul Mason, and especially if Adam Curtis is involved. Actually I can – that’s what this whole blog is about. Curtis’s films are predicated on rubbishing all pre-existing counter narratives so his own contorted version of reality can have free reign. It’s a form of propaganda in itself. But specifically, on this point, in my experience, people who claim to be telling you The Truth – with a capital T and a capital T – are usually telling you what to think. Paul Mason – the avuncular Leader’s finger-pointing-footsoldier-in-chief. Mason especially favours jabbing his finger when he’s telling us The Truth. What is it with the Corbyn lobby and finger jabbing? A rudimentary look at policies enacted under a succession of governments of different colours will show any reader within minutes if not seconds that this is plain daft and counter factual. I’m not going to list the wide spectrum of policy outcomes that prove this. No, really, I’m not going to – get off your arse and wiki it, or maybe just, like… ‘remember’. If the generaliser isn’t being wilfully revisionist then their only excuse is laziness. Again, it’s about closing down discussion. Rather than assess the pros and cons, successes and failures of policy over many years – (yup, some things work, some don’t, some things work in part… and guess what, you have to take time and thought and effort and compromises and negotiation to work out how to improve and build on successes) – it’s effectively saying ‘anything that comes from Blair, Brown or Miliband is all crap‘ – and taking a short cut to the bogus conclusion that if all other Labour policy is, in effect, Tory policy, therefore Corbyn’s Policies must be the only proper Labour ones – which in turn leads to the other annoyingly unsustainable assertion that Jeremy Corbyn has Real Labour Values/is a True Socialist/embodies the soul of the Labour Movement etc etc and erroneous etc). Not only does this make very little sense but it rubbishes the hard work of hundreds of people who have, themselves, made real and positive changes to society in successive Labour administrations. It’s insulting to the collective nature of the Labour Movement and smacks of idolatry. And when I say that the distinguishing policies of recent Labour administrations are ‘real’ I’m talking about REAL insofar as they actually HAPPENED. That kind of real – not the kind of real that isn’t actually real at all. The high end version of ‘New Labour’s the same as the Tories’ is to dismiss all non-Corbynite Labour policy as ‘slavishly adhering to the Neoliberal consensus‘. There’s nothing that makes my heart sink in a political discussion like the brandishing of the bloody ‘Neoliberal Consensus’. Ok, so yes, neoliberalism is a thing, but again and again I hear it brought into conversations with the same swivel eyed certainty that Jennifer Lawrence uses in American Hustle when she talks about her microwave as The Science Oven. It’s an impressive economic term – and economics is a science, right? – so it’s, like, using science to prove a point! Perhaps it’s the addition of the word ‘consensus’ that really grates – as if ‘everyone we disagree with’ has an identical understanding of/belief in free market economics. They don’t. They really don’t. Favoured levels of economic intervention fluctuate hugely – not just between Labour and Conservative, but within the parties themselves. Deciding there is a consensus makes the rubbishing counter arguments fabulously easy. If anyone who acknowledges that the UK has to operate within the context of global markets and capital can be dismissed as a disciple of neoliberalism – and thus little better than a nostril flaring, lip curling Thatcherite – then yet again any kind of proper engagement with real world complexity is closed down. If you follow the blanket fingers-in-the-ears eschewing of all things neoliberal through to its logical conclusion, it posits a Corbyn run UK trying to function outside of global market economics altogether. You don’t have to be a disciple of Reagenomics to think that this might be a tad challenging… although I suppose North Korea is something of a role model. Using the Neoliberal tag as an intellectual fire blanket is lazy. Working out how to interact with market forces in the interests of social justice is hard work… and unavoidable. …as if it proves anything except that all the people who agree with him have assembled in one place, and that the 72% of voters who aren’t so keen didn’t turn up. Much has been written about this – Owen Jones’s contribution being perhaps the most eloquent. I don’t have much to add, except that a few years back the Marmoset spent two years researching a project about Oswald Mosley and the British Union of Fascists in the 1930s. In a divided Britain, torn apart by the poverty of the depression, Mosley’s brand of Socialism – National Socialism – was seductive, energising, and attracted enthusiastic disciples in their tens of thousands. Mosley packed out the Albert Hall several times, and in 1934 he packed out Olympia with 11,000 adoring supporters. This was quite an achievement in the days before social media or inter-city pendolinos. Luckily the rest of the country weren’t so keen. Calm down!! Don’t have an aneurysm. I’m not making some ridiculous parallel between Mosley’s politics and Jeremy Corbyn. I am, however, making a point about the folly of obsessing about the size of your crowd. Mosley and his supporters were convinced he was far more popular than he was, but the BUF never got an MP into parliament, nor a single representative onto the London County Council. So what were those rallies supposed to do? They were a demonstration of strength; of unity; of a new movement coming together resolved to transform society; and, most of all, they were a demonstration of adulation for their inspirational Leader. And then ask yourself: How does the picture of that crowd make you feel? From a post holocaust perspective we carelessly assume that was its intention – to spread fear – but I’ve spent many long hours in the Mosley Archive at Birmingham University and that’s not entirely the case. Mosley wanted to inspire people, and prove that his was a movement rooted in – and working for – the people. But the BUF leader learned – as does every person who aspires to political leadership – that it’s how you engage with those who DON’T agree with you that determines your success or failure. It’s a lot harder than addressing a crowd of cheering supporters. That’s the lazy option. I fully appreciate that making reference to Mosley in this context will be considered wilfully provocative by some, but the reason I very specifically choose to do so, is to make the point, as vividly as I can, that gathering a crowd of people who agree with you – no matter how large – does not, in itself, signify oncoming political success, and neither does it in any way mean that you have ‘Right’ on your side. Eighty years later, that Olympia picture still has the power to creep us out. Maybe bear that in mind the next time you post a picture of Jeremy’s Massive Throng. It’s absolutely fair to say that some of us were never too keen from the word go, but while I’ve been writing this, Alex Andreou has posted the definitive blog from the point of view of someone who started out a devoted follower and whose faith in The Big C has been severely dented over the last year. There’s not a lot I can add to Andreou’s deft analysis and his clear assertion that Jeremy is the leader – he has to earn his place – earn our respect – win over the doubters – and that the continual buck-passing doesn’t hold water. This is front line politics. No one owes you any favours. You don’t get let off the hook until you prove yourself. Take a look at Theresa May… whether or not you agree with her, and despite the mistakes and mis-steps, she has made a point of hitting the ground snarling and letting the whole country know who is most definitely in charge. But the buck passing by the Corboscenti is fascinating. How many times do we bay for someone’s blood – be they a government minister, a director of social services, the head of a bank, or the Metropolitan Police Commissioner, or the DG of the BBC…? The failings may be occurring in the lower ranks, but the head honcho has to take the rap. Obvs! But not our Jerrybubs. My favourite recently came from a friend who said: ‘But it’s not fair to criticise Corbyn, he’s just been left with Labour at a bad time.’ That’s a charitable variation. More commonly Corbyn’s woes are laid fairly and squarely at the door of mysterious and often unnamed Blairite plotters; the Parliamentary Labour Party for not supporting him; in fact literally anyone but Jeremy himself – and if Labour are languishing in the polls it’s because they were determined to undermine him from the off. Even if a small number in the PLP were so inclined (see above), if the party tears itself apart under his leadership then it’s HIS responsibility. He’s the leader, it’s his job to fix it. That’s what leadership is. …those by-elections were in safe Labour seats. The London mayoral election had to actively distance itself from Corbyn. Outperforming the government in your first year as opposition leader, by losing marginally fewer councils than they did, is a terrible sign by any metric. And what about Labour finishing third in the Scottish election? Reversals to tax credits were primarily down to Tory backbench unrest and disability cuts down to a superb defence by the Labour Lords team – most of them Blairites – both on a shadow brief led by none other that the much-reviled Owen Smith. The fiscal target u-turn was abandoned by Osborne the day after Theresa May, the then frontrunner for PM, said she didn’t support it. Labour’s dreadful performance in the polls is put exclusively down to the PLP “coup”. Even though Labour was declining long before it, hitting its peak (and never actually ahead on average) in April. Corbyn himself encourages this myth. “We were ahead in the polls in May”, he said in yesterday’s hustings – an outright lie. This is by far the worst period in Labour’s history in my thirty-eight years of political life, and it’s happened on Corbyn’s watch. To be fair, this chart topper doesn’t quite fit in my bottom ten lazies – it actually takes quite a lot of effort to keep coming up with all these excuses. You might not have seen this too often, but it does crop up in various versions from time to time – a suggested correlation between Jeremy Corbyn and the Labour Prime Minister 1945-51, who introduced the National Health Service, nationalised a raft of industries, and set a socially conscious state centred political agenda (the Keynesian post war consensus if you want a real consensus to chew on) for a generation until Margaret Thatcher started to disassemble it in 1979. But there the similarity ends. Attlee, for those who don’t know, led the Labour Party for twenty years. He held ministerial office under Ramsay MacDonald and crucially was Deputy Prime Minister under Winston Churchill – a Tory – from 1942 to 1945, running much of the domestic agenda while Churchill got on with winning the war. Attlee was an administrator, a negotiator, a fixer, a highly practical political operator with a keen sense of which allegiances and compromises needed to be made in order to operate effectively – an experienced politician who won the trust of the nation after years of public service. He was most definitely not a pacifist and certainly not a unilateralist. Churchill later vehemently denied saying any such thing about Attlee with whom he’d worked successfully and respected hugely – demonstrating that truly talented leaders look beyond their own tribe when honouring the democratic mandate at the highest level. Jeremy Corbyn refused to share a platform with David Cameron in order to help keep the country in the EU. If you want to find a twentieth century parallel for Jeremy Corbyn take a look at this guy. When I read people comparing Jeremy Corbyn to Clement Attlee it’s like watching history being spray canned by the world’s least literate graffiti artist. It’s the ultimate laziness. The laziness of people who can’t even be bothered to read a book. If you’ve got this far – and there should be prizes for anyone who has – you are anything but indolent! – the reader might be feeling a bit irked by the confrontational and downright narky tone of some of the Marmoset’s chart rundown. Even if I’m not actually calling people with whom I disagree ‘lazy’, admonishing their political reasoning as such is equally high handed. At the heart of this blog is the proposition that he has done exactly the opposite. Yes, he has shunted the Labour Party to the left, but that’s not the same as a debate. While the centre and centre-left tries (and fails) to get back to a serious programme for wresting power from the Conservatives, the Corbyn left is mired in a choking smog of self adulation and mind numbing political reductiveness. He hasn’t stimulated the debate – he’s paralysed it. So, pop pickers, calling this kind of thinking ‘lazy’ is actually about as forgiving as I can manage right now. Life’s complicated. You can’t always get what you want. Getting stuff done is hard. Really, really hard. We have to keep asking questions and not be afraid of difficult answers… or not getting an answer at all. We have to keep listening – to everyone – especially those we disagree with most – and more than that, address the difficult decisions we have to make if we actually want to get anything done. As a writer I start every day, every line of dialogue, every declaration of my convictions by wondering whether everything I believe in could be wrong.